Nazareth is the capital of, and largest city in, the North District of Israel. 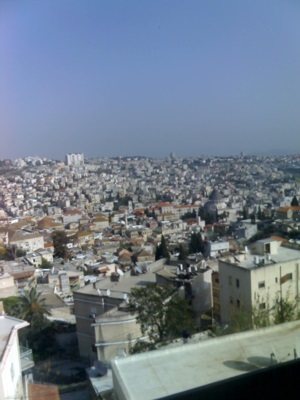 As of 2006, Nazareth had an estimated population of 64,800. During 1948 Arab-Israeli War, the city, despite having a majority Arab population, was easily captured by Israeli troops. Arab town leaders agreed to a formal surrender document in exchange for promises for Israeli officers, including Ben Dunkelman who led the operation, that no harm would come to either the town or the civilian population of the town. Hours later Haim Laskov (who would later in life become Israeli Chief of Staff) ordered Dunkelman to expel all Arab civilians from the town, but Dunkelman refused the order. Laskov then tried to get the order sanctioned by higher authority, but David Ben-Gurion vetoed it. As a result of these events, the Arab population remained in the Nazareth, and today the city is home to a large number of Israel's Arab citizens, and acts as the effective capital for Israeli Arabs. The Church of the Annunciation - The largest Christian building in the Middle East, and in Roman Catholic tradition, the site where the Archangel Gabriel announced the future birth of Jesus to the Virgin Mary. The Synagogue Church - The traditional location of the synagogue where Jesus taught. Church of St. Joseph's Carpentry - The traditional location of Joseph's workshop. Mensa Christi Church - The traditional location where Jesus dined with the Apostles after the Resurrection. This is a Black and White edition of Travel Like a Local map book. Are you planning your next vacation abroad and you’re ready to explore? Do you want to be prepared for everything? Are you ready to experience every new place you visit just like a local? Well, with this amazing Nazareth (Israel) travel map you’re all set and ready to go! In the Nazareth (Israel) map you can see all the available means of transport, bus stops and routes so you can always know how to get everywhere. And because we know that a vacation is not only about the roads and busses, the map gives you many options for eating, drinking and having a good time! We carefully marked all the restaurants, bars and pubs so you can always find one that is nearby. In the Nazareth (Israel) map you will also find the best places to go shopping, the most famous and must-see sights, churches and more. And if an emergency comes up, there are markings of police stations and hospitals everywhere for your convenience. So what are you waiting for? Pack your bags, get your Nazareth (Israel) map and let’s get started! Hiking the Jesus Trail is a once in a lifetime experience for every Christian. The Jesus Trail passes through Nazareth, Cana, the Mount of Beatitudes, the Sea of Galilee and Capernaum. You can be baptized in the Jordan River, climb Mount Tabor and ascend Mount Precipice. The journey ends in Jerusalem. You will visit the Church of the Visitation, the Room of the Last Supper, Gethsemane, the Tomb of Mary, the Via Dolorosa and the Holy Sepulchre. Bethlehem is only ten kilometers from the trail.Pilgrims frequently describe their hike in the Holy Land as a life-altering experience. Some find it difficult to express the bliss they feel during this spiritual journey. After their hike of the trail, a group of pilgrims from Italy wrote: "When we completed the hike of the Camino de Santiago de Compostela (Way of St. James) we were excited. But it was nothing compared to what we felt when we ended our hike of the Land of Jesus at the Holy Sepulchre in Jerusalem. We were elated, crying with joy and blessing the Lord for our journey".The Jesus Trail guide contains all the information you need to independently walk the Trail connecting New Testament sites in the Galilee and Jerusalem. The guide includes high resolution maps of the region 1:45,000 in English, maps of Jerusalem 1:15,000, road maps 1:250,000, hike description with elevation charts of 14 days in the Galilee Holy Basin and Jerusalem. Historical information about dozens of relevant Biblical sites, practical information about travel, accommodations, gear, short dictionary, and more, link to a website with free GPS tracks covered in the guide and updated trail conditions. The trail connects to the Israel National Trail in Nazareth and Migdal. Jesus travels to India and Tibet for this area was the cradle of the early great religions. Jesus wants to understand their key beliefs and how these comply to the Ten Commandments, given by God to Moses, which is a critical test. Jesus believes that God’s over-arching ambition for Mankind, is embraced by the Twin commandments of Love which seamless incorporate the Ten Commandments. Jesus is close to full Oneness with the Triune God. When this is achieved Jesus will embrace suffering and death and will offer this to the Father in atonement for man’s sins and to restore man’s favor with God. Jesus will evaluate the earlier religions for these were inspired by God and must not be ignored. Mary will help Him. The Nazareth (Israel) map was carefully designed to give you amazing results and make traveling easier than ever. We make sure to constantly update our info to give you the most relevant and accurate information, so you will never get confused or frustrated during your Nazareth (Israel) trip. The map is very detailed and it will not only give you all the available roads and routes, but also the essential information to make your Nazareth (Israel) vacation unforgettable. In the Nazareth (Israel) map you will also find the best places to go shopping, the most famous and must-see sights, churches and more. From epic cliffs to gentle fields, from bustling towns to the peaceful lake shores of Galilee, take a journey on the Jesus Trail and watch the Bible and history come to life. Walking the Jesus Trail contains all the information you need to independently walk the 65-kilometre (40-mile) Jesus Trail connecting New Testament sites in the Galilee region of Israel. Literally walk in the footsteps of Jesus between sites such as Nazareth, Capernaum, and the Sea of Galilee, and dozens of other sacred historical sites. Doesn't matter if you are a fan of the Mediterranean diet or just love the Mediterranean food – this book is your best Mediterranean food recipes source! Enjoy a sampling of the most renowned restaurants in Nazareth and their authentic Mediterranean food recipes, handed down from generations past. You will also discover recipes to which modern generations of family chefs have added their own special touches and twists. “Nazareth, A fascinating city of culture and cuisine” (Abridged Version) the new book by Elinoar Rabin, is delight for all the senses, and it provides an entirely new way to explore the ancient city of Nazareth. Elinoar uses a perfect combination of Nazareth’s history, culture and cuisine, accompanied by gorgeous photography and mouthwatering authentic recipes to provide a sensory experience that is not soon forgotten. Elinoar gives us a look inside Nazareth’s food industry, including tahini factories, butcher shops and bakeries. She introduces us to the unique personalities of restaurant owners and chefs, as well as the proprietors of several food factories and boutique food shops. Learn all about the origin of the cuisine which has combined over the centuries to provide a wide range of food preparation techniques and recipes, in Arabic, traditional Israeli, Turkish and Mediterranean cooking. Mouthwatering traditional main dishes including grilled skewers, hummus and falafel, along with tempting desserts and specialty dishes – all made with fresh local produce, locally grown specialty spices, seafood and traditionally favored meats can all be found between the covers of this book. In addition, you will find several recipes for trendy Mediterranean fare that offers a healthy choice of cuisine made with fresh ingredients on the lighter side. The books abridged version offers 26 out of the 97 recipes available in the full version as well as a map with a sampling the signature places to see during your visit. Take a fascinating cultural trip back in history with historical information, interviews, stories and anecdotes, which are all unique to Nazareth. If you are left wanting more, you can always get the full version with 97 recipes and also a guide to the most fascinating sights and places to see or sleep in.